Designed for use in contact centre environments, the Jabra BIZ 2300 QD Unify Headset features HD voice, Wideband Audio, and noise-cancelling technology for performance you can rely on. While exceptionally lightweight in order to maximize the wearer's comfort, the Jabra BIZ 2300 is also highly durable. It is built for easy handling and intensive use throughout the day, and thanks to its adjustable headband and microphone boom arm, the user may fit it to match their preferences. Clearer conversations are afforded by wideband audio and dependable noise cancellation for blocking out unwanted background noises during phone calls. The headset is also equipped with in-line call management and volume controls. Why Should You Buy these Corded Headsets? 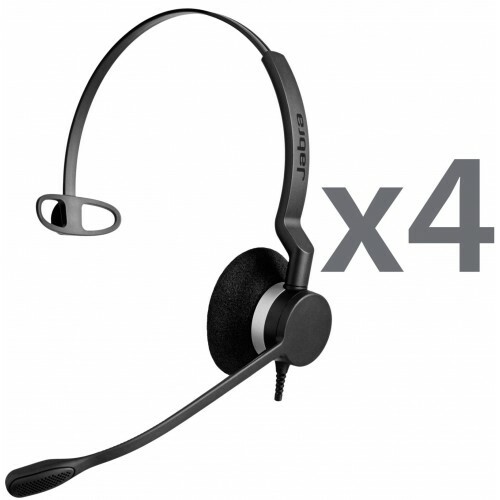 Stylish, dependable and easy to deploy thanks to plug-and-play technology, this comfortable and well-built set of four headsets is an ideal choice for any call centre environment which makes use of Unify OpenStage telephones.